Hello everyone and thanks so much for stopping by to help celebrate the launch of Hero Arts December My Monthly Hero Kit (more about the kit, blog hop and giveaway below). I have to say I love Hero Arts kits for how unpredictable they are. You never know what theme is going to be featured in the next month kit or what colors/images will dominate. I was pleasantly surprised and very excited when I saw the kit for December. The background stamps as well as the stencil inspired me the most and thus I made several cards featuring a few background ideas. 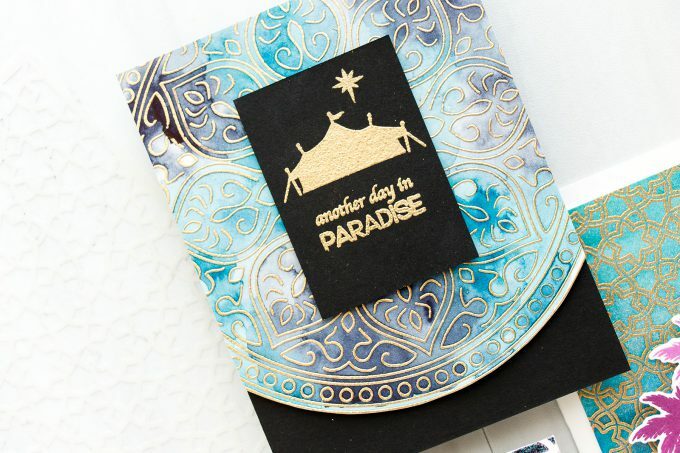 To create a background for my first card, Another Day In Paradise, I heat embossed Mandala Background in Brass embossing powder (I used this powder for all of my heat embossing today) onto Arches Hot Pressed watercolor paper and colored it using my Daniel Smith watercolors in Indigo and Ultramarine Turquoise. Once my background was dry I cut it out right up to the edge of the image forming a semicircle. I trimmed it to 4 1/4″ wide and foam mounted onto a black A2 side folding card. I also heat embossed a tent, star and a sentiment from my kit onto a black panel and foam mounted it on top of the background. 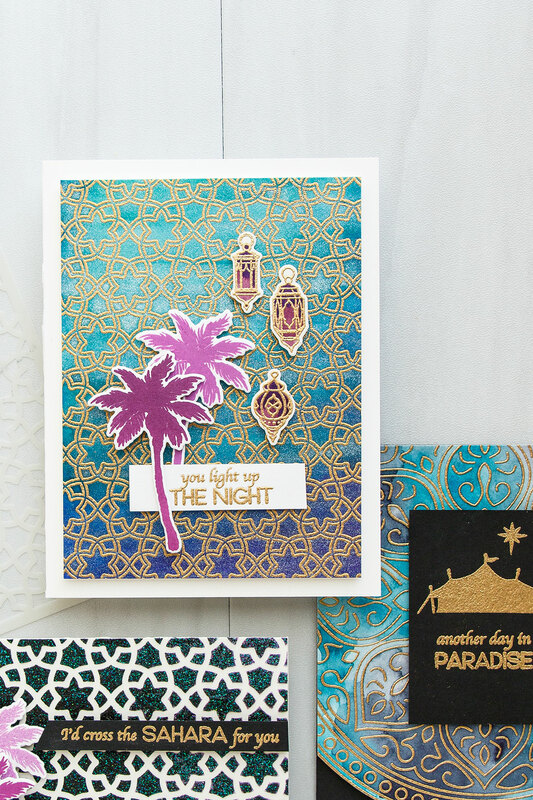 To create a background for my second card, You Light Up The Night, I heat embossed Floral Tile Bold Prints background onto same Arches Hot Pressed watercolor paper and watercolored it using Aqua Flow Pens from Tonic Studios. I used Azure Blue, Aqua Splash and Indigo Dawn colors and added a generous amount of shimmer using Tonic’s shimmer pen. My background was trimmed to 3 3/4 x 5″ and foam mounted onto an A2 side folding card base. 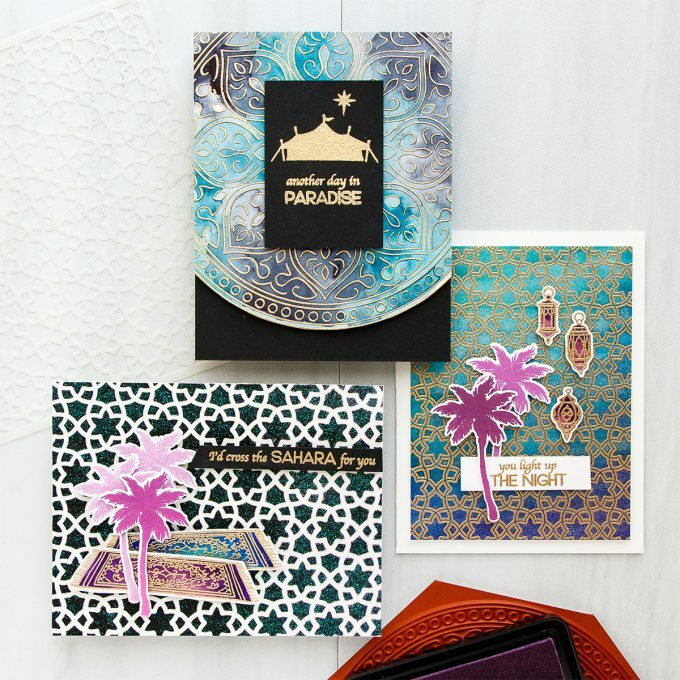 I also stamped two palm trees, heat heat embossed lanterns and sentiment and used those images to complete this card. My third card, I’d Cross The Sahara For You, features a glitter paste background. 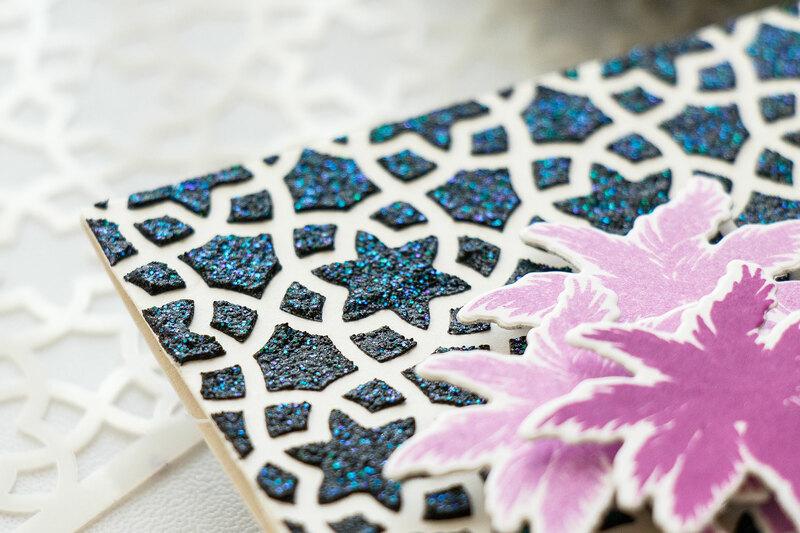 I used the stencil included in this month kit with Black and Purple glitter pastes from Tonic to create a rich and bold background on white cardstock. I adhered my background onto an A2 top folding card base, added several die cut palm trees, two oriental rugs and a sentiment. The kit is available for a limited time only – once it’s gone, it’s gone. If you love it – better grab it now! Kits begin shipping from Hero Arts on Friday December 7th. Hero Arts is giving away one kit as a prize to one blog reader – selected from the comments across all of the blogs in the hop so be sure to leave a comment for your chance to win! Giveaway closes Sunday, December 10th at 11:59pm, and the winner will be announced the following week. Yana, these are amazing cards. I love the backgrounds you share. This kit has so many beautiful possibilities. Thank you for sharing. BEAUTIFUL! Love how you watercolored the mandalas. 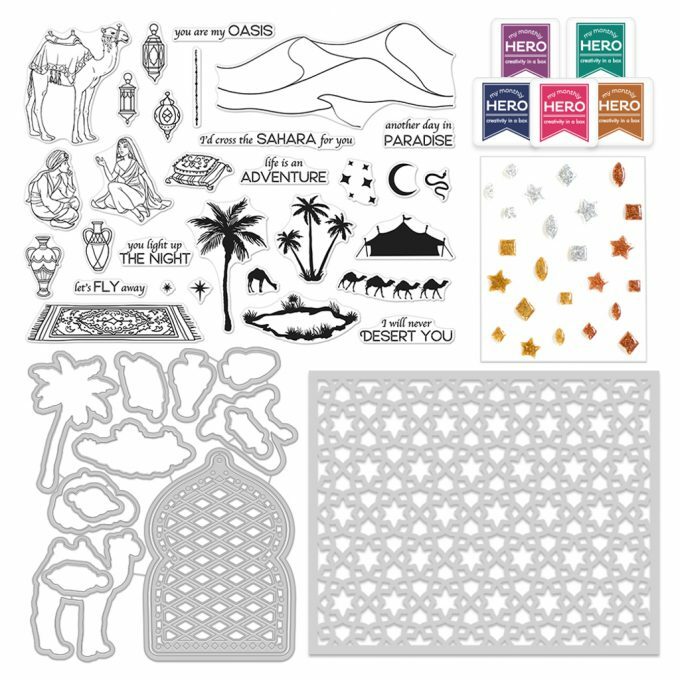 Loving your gorgeous creation with this new kit! I really love the way the brass embossing powder looks against the watercolored background…especially with the colors you chose.. Your cards are gorgeous! This is really a unique kit. I’m so impressed! I love how you colored the carpets and the lanterns. They look so realistic. Great cards! WOW! Love them Yana, especially the first one! Absolute stunner of a kit. I love how it’s a bit different and celebrates other cultures in such a clever and sophisticated way. Gorgeous jewel tones. Stunning cards!! 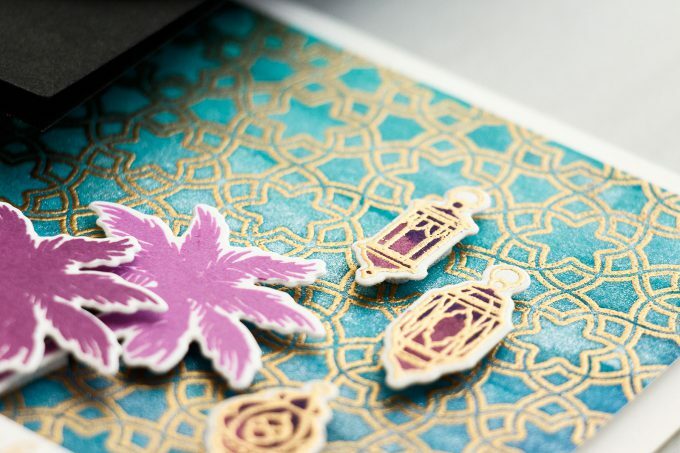 I love what you did with the mandala stamp! Love how you created so many lovely backgrounds. This kit is awesome and unique. I’m so excited. I love the three cards you made and the colors are just so beautiful and bright. Thanks for sharing. Your cards are amazing! I especially love the background colors of the first one. Thanks for the inspiration! I struggle with background stamps, so your tutorial is really helpful! Love all the backgrounds that you created and the cards from those are just beautiful! Wow, wow, wow. These are amazing! Thanks for the inspiration! Beautiful cards! 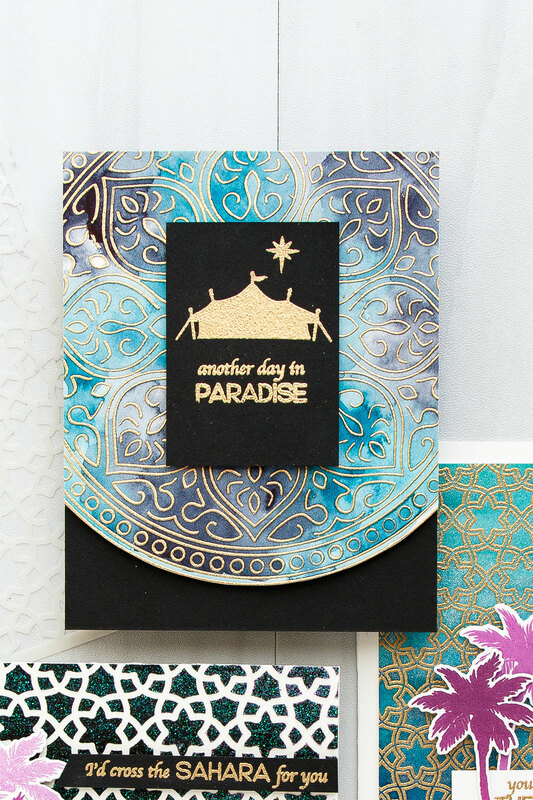 I love the mandala background card especially , thanks for the video! Beautiful cards! Love all the backgrounds to the cards especially the mandala card. This kit leands to such awesome vibrant colours. Thank you for the inspiration! Love your Mandala background! I can’t wait to try it out. Wow, these cards are beautiful. I love the glitter pastes and the aqua pens yup used here. Love how you created your cards! Beautiful cards! 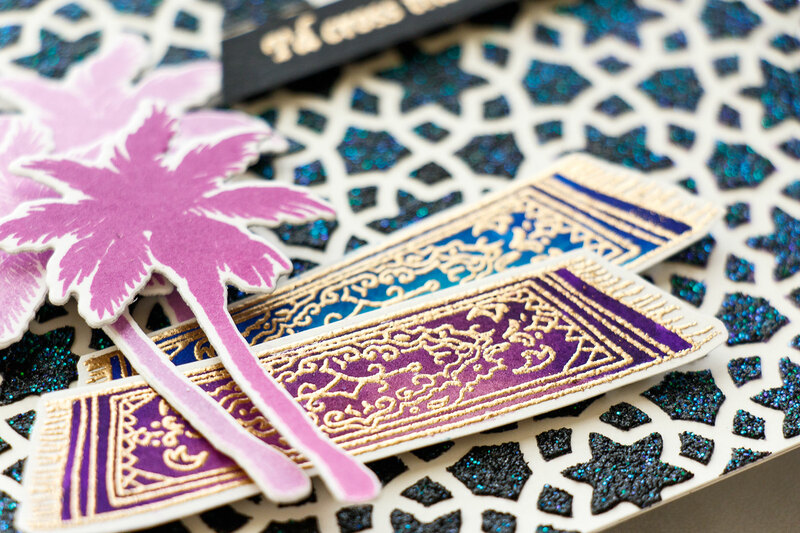 They look very elegant with the embossing powder. I love the way you created these backgrounds. They are so different and gorgeous! Thank you! Such fabulous cards and colours Yana. Thank you for all the inspiration. Holy cow, you’ve been hopping like mad these last few weeks! I’m kind of in awe of your time management skills. These cards are all beautiful, and I know I’m biased, but watercolors are absolutely the way to go. I love how the indigo and turquoise look with each other against the embossed mandala. 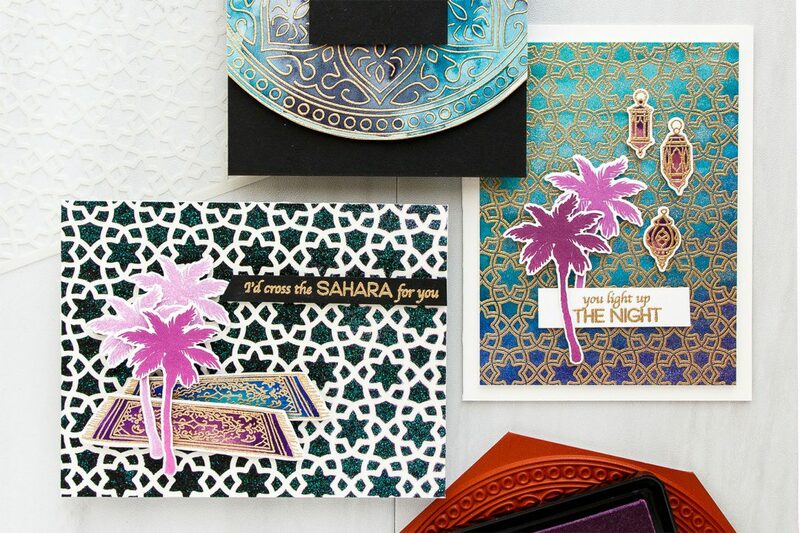 Thanks for sharing such beautiful cards (and pink/purple palm trees! I never would have thought of that). Wow, such gorgeous cards – love the rich colors & textures. The backgrounds for each of these 3 cards are just beautiful! Now I am going to have to get the add-ons for this kit. These cards are so rich and exotic! What a fabulous kit!! Love this kit! It’s so exotic and very different from anything I’ve seen recently. I can’t wait to get my kit and start making some cards with it. 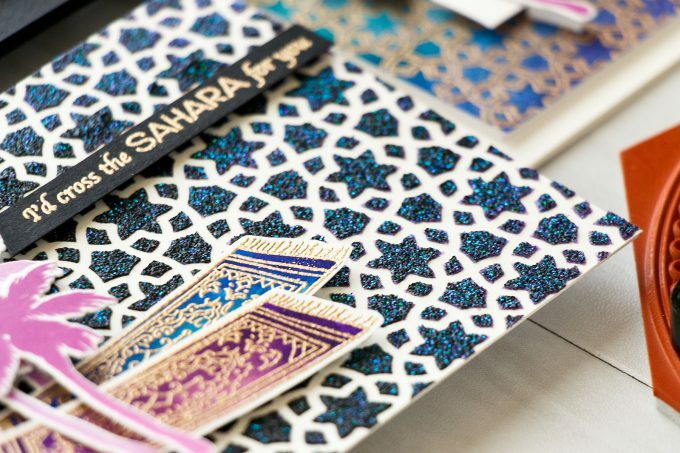 Gorgeous cards with this awesome kit! Love your color combos and details! I love your watercolor gold card. Stunning creations! I love the second card you made! Lovely card ideas.. Thanks for the video showing how you created these. Love how the blackish background turned out. 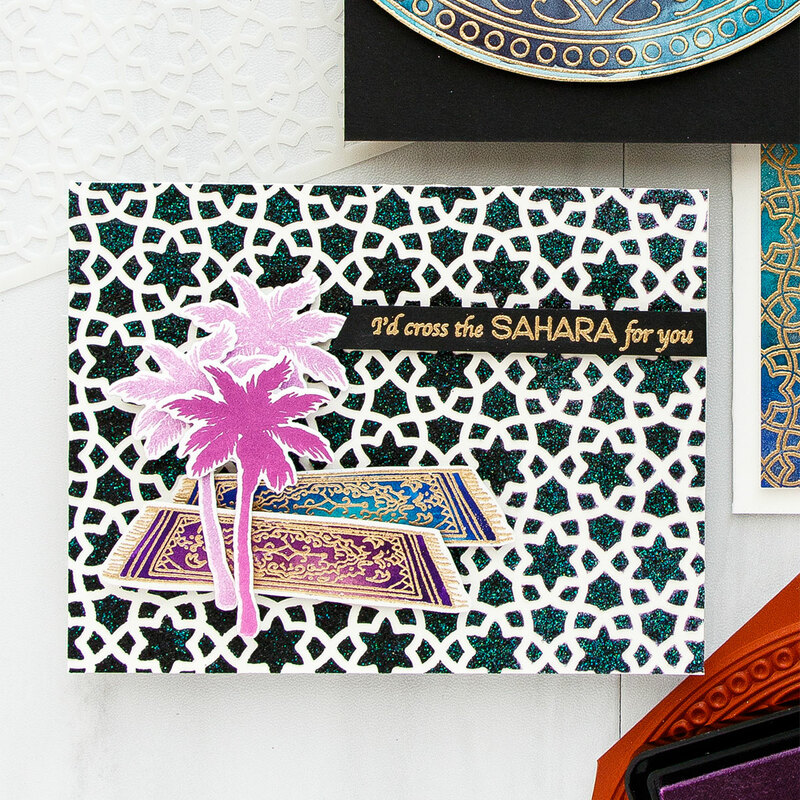 I’m a great fan of geometric design so I love the gorgeous backgrounds on all your cards. Thanks for sharing your technique video. Everything about this card is stunning! Love these cards and the beautiful backgrounds. Thanks for the tip on hot press vs cold press too! !